Voltz Electrical & Data Pty Ltd is a fully licensed and insured electrical services company based in the eastern suburbs of Melbourne. 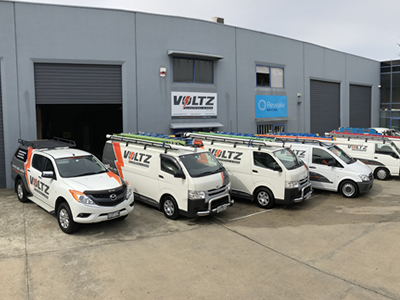 Established by electrician Daniel Browne in 2009, Voltz Electrical & Data provides a wide range of electrical services to commercial & industrial clients including builders, developers, property managers and more. Voltz has built a reputation for providing only the highest standard of electrical work, as demanded by our clients. We believe in profitable, sustainable and enjoyable long term relationships with both our customers and suppliers. Daniel is a qualified electrician with over 15 years experience. He has worked on a range of electrical contracts for government, commercial and residential customers. He was previously a project manager for a large electrical contractor where he worked on major commercial construction projects. Prior to this, Daniel was working with a mid-sized contractor where he was involved with looking after service and maintenance contracts for many government schools, police stations and metro ambulance branches. Mark has been in the electrical industry for 8 years and has experience in a variety of electrical installations. Mark has a clear understanding and broad knowledge of the electrical trade. His experience covers residential, commercial and industrial projects as he been involved with both the building and construction of these projects. Mark deals directly with the clients and technicians, to provide success in the delivery of each project and service request. His thorough technical understanding ensures a clear level of communication from the office to each technician. A valued team member, Mark has been a part of Voltz Electrical & Data since its inception in 2009. Gareth has been in the electrical industry for 8 years. He served his apprenticeship doing a broad range of maintenance and fault finding across the domestic, commercial and industrial sectors. Gareth has been a part of Voltz electrical for 4 years and has been involved with many construction projects as well as looking after our service & maintenance contracts. As our Service & Maintenance Manager, Gareth deals directly with clients and property managers to ensure we are providing an excellent service and deal with any issues that may arise.